Think of “Celebrity Culture” as a modern phenomenon? Think again. I’ve heard stories of people being “huge celebrities” in their time before – Nell Gwyn, Mozart, Jesus – but never been entirely sure of exactly how far these examples are comparable to what we understand the term to mean in the 21st century. It’s always sounded like they were either celebrities for locals, the aristocracy, or fanatics (or indeed, a mixture of these). But if there’s one thing I learned from Edo Pop, it’s that 19th-century Edo (now Tokyo) had exactly the same obsessions with celebrity that we do. We’re told here that 80% of all the woodblock prints made were of famous actors. 80%! That’s pretty comparable to anything you’ll find in any tabloid newspaper. Wanting to see it right away, 1852. Before Netflix made that possible. So the pictures in this show aren’t just art, they’re historical documents. And this is what is, to me, the most striking and fundamental aspect of this show. That unlike the most famous art from Europe at this particular time (an era of oil paintings & allegory), I feel like these prints are both about, and appealing to, an audience who are really living. Just like photographs do now, they give us a glimpse into the contemporary society of the artists – and the people who bought these mass media products to hang on their walls*. When these ukiyo-e (“floating world”) prints started arriving in the 19th century, people didn’t really care about this. These prints were admired for their exoticism and their beauty, qualities on show in abundance in the prints that form Edo Pop. Nowadays of course we are all so familiar with the visual style of Japan. 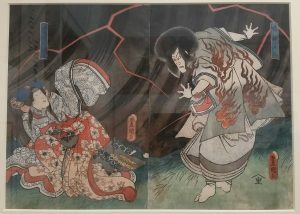 But then I think about how many people still obsess over manga and anime for their unique style, and the lineage from these prints to those forms is so clear. Look at the Kuniyoshi print Fifteen year old Samurai killed by Gunfire, from 1848, and how the representation of the bullets is exactly like what you might see in a cartoon. 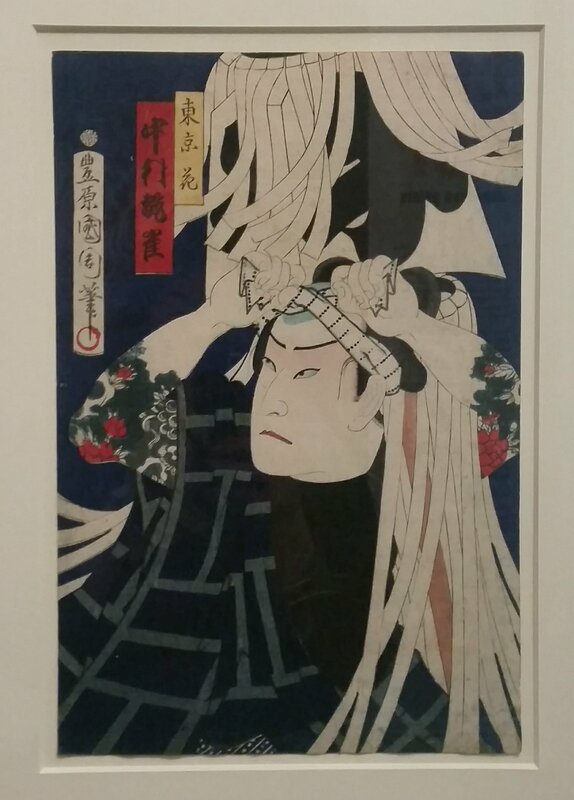 Or the supernatural figure in Kunisada’s The Ghost of the Depraved Monk Seigen, 1852. The fact that this is a completely different visual language from what we have grown up with in Europe is still striking today. The Ghost of the Depraved Monk Seigen. And no wonder these took off in a serious way when they came to Western shores – they’re so beautiful! I love the fact that even though these woodblocks were always intended for mass reproduction, they’re so exquisitely detailed. Look at any of the costumes being worn, or the decorations adoring the theatre walls, and you at the very least admire the craftsmanship that’s gone into making them. Add in the bold colours and clean lines, and you have images which are definitely closer to art than paparazzi. Fire Brigade Standard Bearer – because every age finds heroes amongst the ordinary people. But as mentioned earlier, the predecessors of paparazzi these are indeed. The show is arranged into categories – actors, genres, prostitutes. They are about glamorous, occasionally explicitly amorous, people. 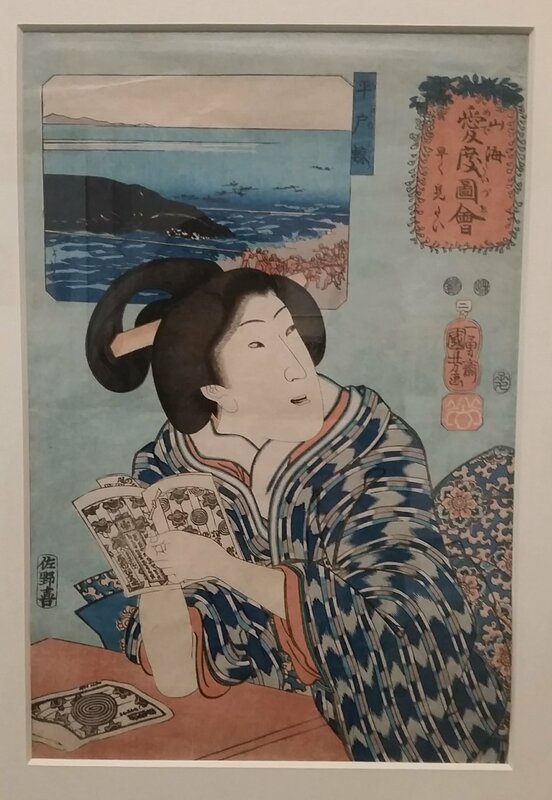 The kind of people who you might expect to have a big Insta following – or indeed the Edo equivalent of a fan club, as is surprisingly depicted in one set of prints. Or the kind of people any marketing agent with scant morals would cash in on after death – as we see in the Death Print of Danjuro VIII, apparently rushed out within hours of his death for fans to keep as a souvenir. I mentioned the word “exoticism” before, but have several reasons for being slightly uncomfortable about using it. Not only does it have connotations of a cultural superiority (the Oscar Wilde quote on the wall is a painful stereotype), but actually, Edo Pop is about anything but difference. I feel more connection with this world of emotions, entertainment and envy of beauty than I do with most of the time-contemporary British paintings dotted around the rest of the Lady Lever gallery. The ukiyo-e in the show comes from the collection of a single man named Frank Milner, who I can only assume must feel, like me, that the prints make a world which has long since disappeared feel real and accessible. I felt that the information and explanation the Gallery’s given around the show is very good indeed, too – visitors have plenty of background and information, but not overwhelmingly so. Altogether Edo Pop is a wonderful exploration of the history and beauty of this unique time and place in world culture. * I’m guessing they hung them on their walls? Would genuinely be interested to know from somebody who knows more about these things than me. **I also wish I knew if there’s a reason so many of the prints are in triptychs? As above, answers on a postcard (or tweet) please. This entry was posted in Exhibitions, Home, Past exhibitions and tagged art, Edo, Japan, Japanese, Liverpool, prints, Wirral. Bookmark the permalink. ← Spots, lines and spray paint.